The RU2 Fast-2150 Speed Display Trailer has a 18” tall character display and when in full operating position, stands over 8 feet tall. The radar speed display folds down creating a low trailer profile for easy transport and storage. 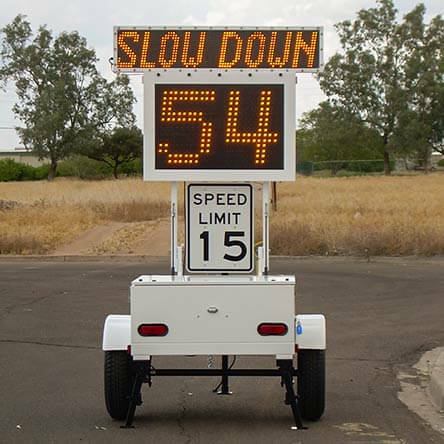 Standard features on our speed signs include high & low speed blanking, flashing digit violator alert and traffic management arrows. Optional features on our radar speed limit signs include our violator alert system (a flashing strip of red and blue LED’s and/or the distinct “SLOW DOWN” message in red LED’s) when approaching vehicles do not slow to the selected speed. Also available is our RU2 Systems Data Acquisition Package, which records the time, date and speed of oncoming vehicles without the use of cumbersome pneumatic tubes placed across the street!